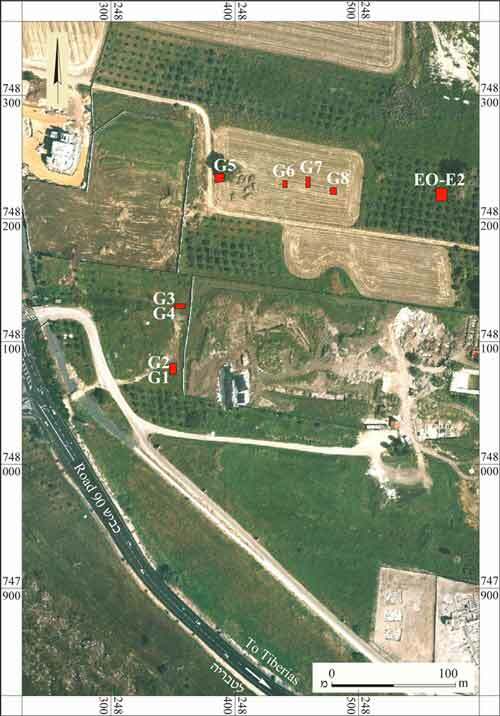 In June–July 2010, a salvage excavation was conducted at the ancient site of Migdal (Permit No. A-5930; map ref. 248302–574/748076–187), prior to the construction of roads 18 and 20. The excavation, undertaken on behalf of the Israel Antiquities Authority and financed by the Migdal municipality, was directed by G. Cinamon (field photography), with the assistance of Y. Ya‘aqobi (administration), A. Najar (area supervision), A. Hajian, M. Kunin, R. Mishayev and M. Kahan (surveying and drafting), D. Avshalom-Gorni and M. Hartal (scientific advisors), H. Tahan-Rosen (pottery drawing) and the participation of laborers from Tiberias and Maghar. The excavation was carried out east of Highway 90, opposite the town of Migdal, in an area slated for the construction of a road that will link Highway 90 with the planned shopping center and the Ark New Gate Hotel compound, and along the road that connects Highway 90 with the Sea of Galilee. The site of Migdal is located on the northwestern shore of the Sea of Galilee, south of the outlet of Nahal Arbel, at the foot of the Mount Arbel escarpment. It is mentioned in historical sources from which we can learn its ancient names: Migdal Nunia (“Tower of Fish”), the Greek name Taricheae (“salted fish”), and Magdala, its most well-known name, in Aramaic. All of these attest to the centrality of the site. 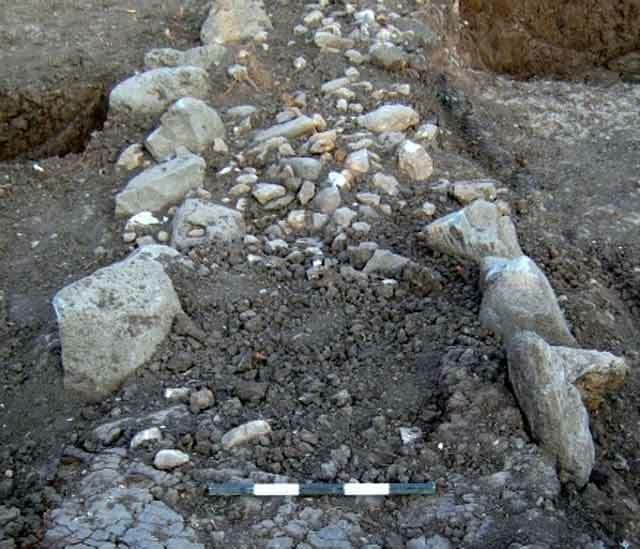 Several excavations were previously conducted at the site, between the Arbel escarpment and the Sea of Galilee shoreline, within the precincts of Resital Beach, in the Franciscan Church compound and in the area slated for construction of the Ark New Gate Hotel (Abu-‘Uqsa 2001; Avshalom-Gorni 2009). The results of these excavations indicate that the settlement was founded in the Hellenistic period and continued uninterrupted until the Early Islamic period. Despite the centrality of the site as described in pilgrims accounts written in the Middle Ages, only meager remains have been found that date from the Crusader period onward. 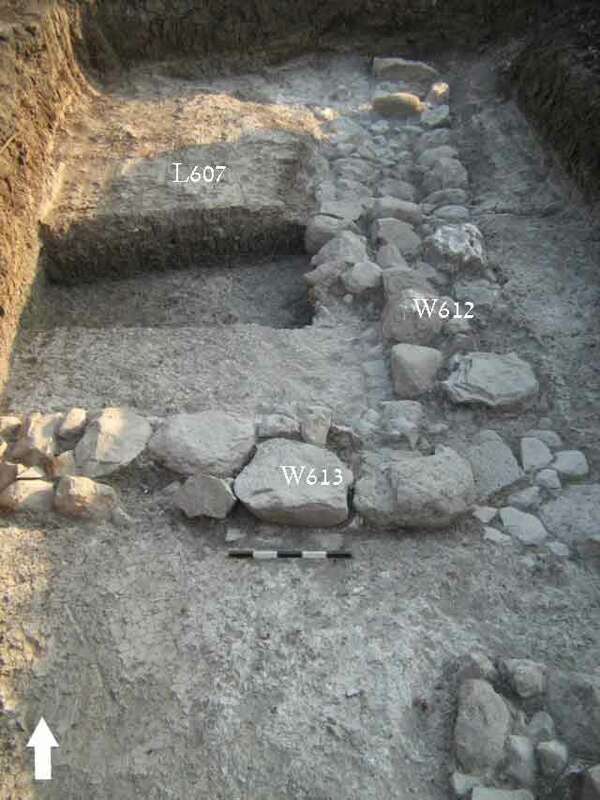 Recently, an extensive excavation was conducted nearby, in the area slated for the construction of the hotel, yielding the remains of a Roman-period synagogue, streets, architectural remains, agricultural installations and water channels (Avshalom-Gorni and Najar 2013). The current excavation was situated in farmland, north of the built-up area of Migdal. Eleven squares were opened in two areas (E, G) along the planned routes of roads 18 and 20, and in accordance with the results of the trial trenches and archaeological inspection. Remains of walls and floors and pottery sherds dating to the first century CE were found throughout the area. Four squares (G1–G4; Fig. 1) were opened along the planned route of Road 20. Squares G1 and G2 (4.0 × 8.5 m). 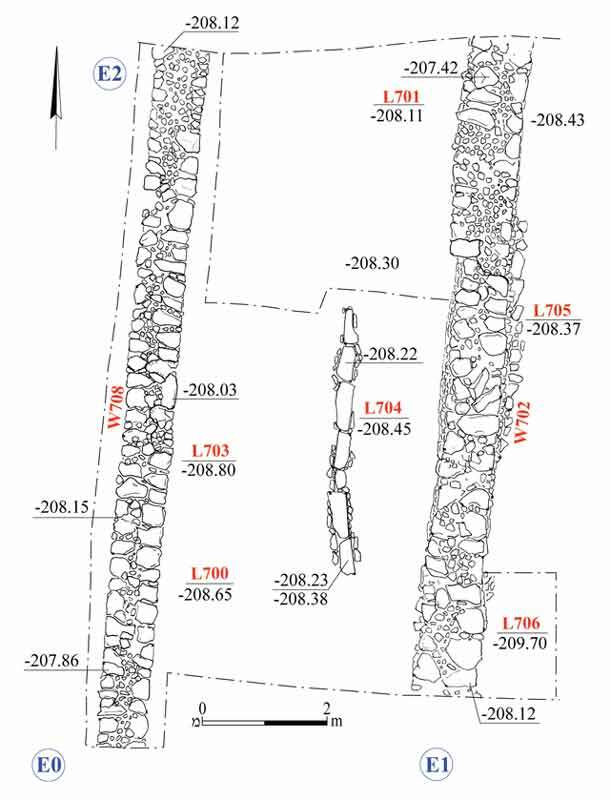 A tumble of fieldstones (L618; length 4 m, width 2 m; Fig. 2) was exposed. A distinct and precise line of stones (length 2 m) was visible in the eastern part of the tumble. Numerous worn pottery sherds dating to the Hellenistic period and beginning of the Roman period were found in both the tumble and the overlying soil. Ten bronze coins were also discovered, but could not be identified or cleaned. Virgin soil devoid of artifacts was exposed below the level of the stone tumble. Squares G3 and G4 (4 × 9 m). Two parallel rows of stones were exposed, running in an east–west direction (length 6 m, space between the rows c. 1 m; Fig. 3). These probably belonged to a foundation of a water channel that was preserved only one course high. Worn pottery sherds dating to the first century CE were gathered from between the stones. 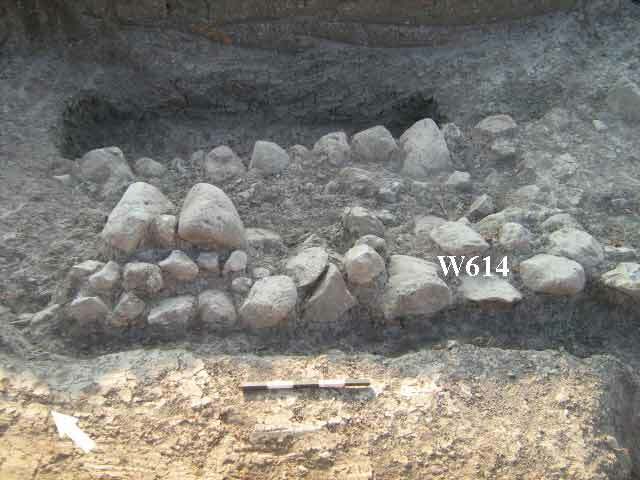 A thick layer of alluvium containing river pebbles and abraded potsherds was found below the foundation courses of the two stone rows; below this layer was virgin soil. Seven squares (G5–G8, E0–E2) were excavated along the planned route of Road 18. Square G5 (5 × 7 m). A layer of river pebbles was exposed. It covered a distinct and precise line of stones which extended from the northwest to the southeast (length 4 m; Fig. 4). It seems that this was the foundation of the northern, exterior face of a channel, of which only one course survived; stones from the upper courses were found scattered about. Numerous worn pottery sherds were noted in this area. A particularly worn bronze coin was also discovered. Its dimensions suggest it is a city coin. These finds date to the first century CE. Square G6 (4.5 × 5.0 m). A well-constructed wall built of densely arranged fieldstones aligned in a north–south direction (length 4 m, width 1 m; Fig. 5) was found. Only a single course was preserved. This wall was abutted by a layer of whitish soil which probably resulted from standing water and sediment that had accumulated during a flood. Worn pottery sherds dating to the first century CE were found on this layer of soil. A probe excavated in the western part of the wall, along its southern face, revealed that it was constructed on virgin soil. Square G7 (5.0 × 9.5 m). A corner of a building was exposed. Its walls (W612, W613; width c. 1 m; Fig. 6) were preserved only one course high. A layer of tamped soil (L607) lay west of W612. It was similar to the whitish layer found in Sq G6. Worn pottery sherds dating to the first century CE were found in it. A portion of another, meagerly preserved wall was revealed in the southern part of the square. A probe conducted in the room ascertained that both the floor and the walls were built on virgin soil. Square G8 (5 × 5 m). A massive wall (W614; length 4.5 m, max. width 1 m; Fig. 7), three courses high, was exposed. Unfortunately, its architectural context could not be determined. Pottery sherds similar to those discovered in the other squares were found in the vicinity of the wall, thus dating it to the first century CE. Squares E0–E2. Two parallel walls, 4 m apart and aligned in a north–south direction (W702, W708; max. length 12.5 m, width 1 m, max. height 1.25 m; Figs. 8, 9). The walls were built of partially hewn basalt stones set on a foundation of pebbles in soil devoid of finds. 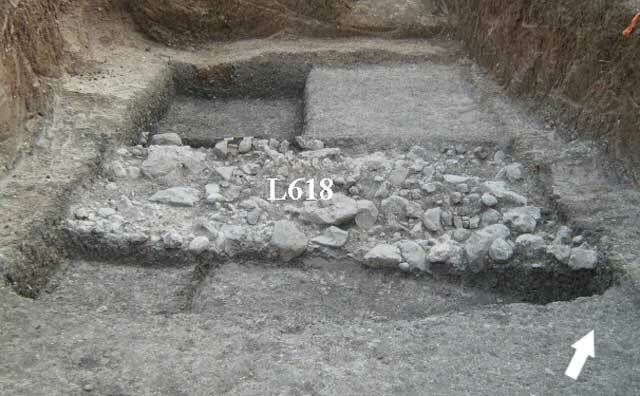 A floor (L703, L704) constructed of tamped earth and crushed chalk was exposed between the walls. A channel built of flat basalt stones and covered with stone slabs was revealed in the middle of the floor, in the space between the walls. Many pottery sherds were found both on and inside the floor, among them vessels for serving and preparing food. This conforms to the homogenous characteristic of the pottery assemblage found throughout the excavation. The bowls comprised broad, flat bowls with a single groove on the rim (Kefar Hananya Type A; Fig. 10:1), dating to 50–300 CE; bowls with two grooves on the rim (Kefar Hananya Type B1; Fig. 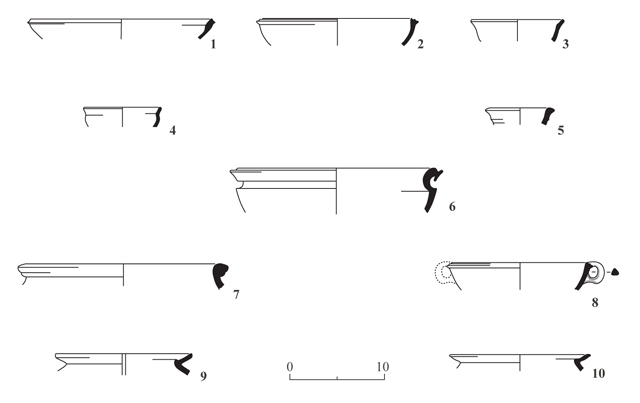 10:2), dating to 90–320 CE; and smaller bowls with a deeper convex body (Fig. 10: 3, 5) that also belong to Kefar Hananya Type B1. Two types of kraters were found: an unusual Shihin-type krater (Fig. 10:6), known in the Galilee from the second century CE, and a Kefar Hananya Type A1 krater (Fig. 10:7), dating to the 50–300 CE. Two cooking-pot types were found: Kefar Hananya Type B1 (Fig. 10:8) and Kefar Hananya Type 3A (Fig. 10:9, 10), both dating to the 50–150 CE. Several coins collected in Area G were in such a deteriorated state of preservation that it was impossible to identify them. Thirteen coins were found in Area E, of which only five could be identified (Table 1). Three others can be dated to the Hasmonean or Herodian period, while two, which were found near the surface, might be from the Umayyad period (seventh–eighth centuries CE). In the western squares of the excavation, only a few wall foundations covered with alluvium containing many worn pottery sherds were found. The remains are dated to the second half of the first century BCE – first half of the first century CE on the basis of ceramic finds. The poor preservation of the walls and the thick layer of alluvium probably indicate the seasonal flooding of Nahal Arbel, which resulted in the dismantling and erosion of the walls. In the northern squares were the remains of more massive walls as well as floors and homogenous pottery assemblages dating to the first century CE. 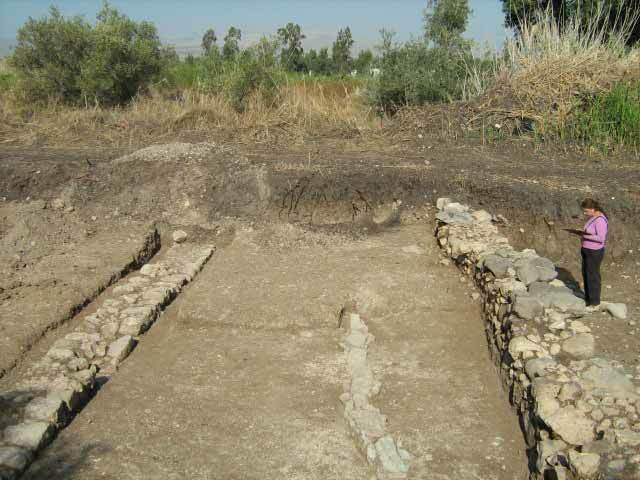 The excavation was located where Nahal Arbel empties into the Sea of Galilee, an area unsuitable for a permanent settlement. 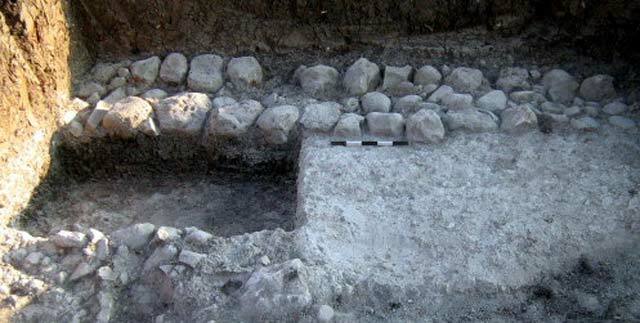 Nevertheless, meager remains of first century CE walls built of fieldstones and tamped-earth floors were found within the heavy alluvium, along with a large quantity of silt that covered the remains. 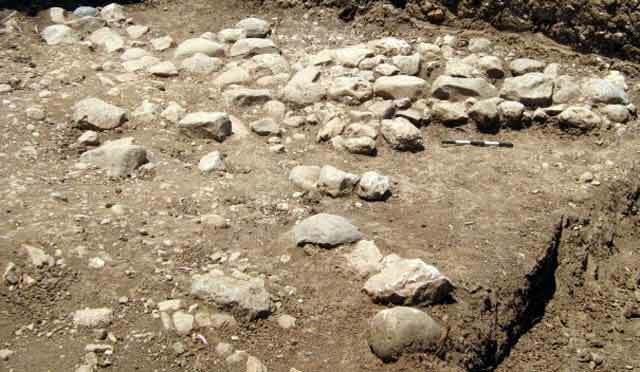 These remains indicate that the excavated area was part of the agricultural land adjacent to the settlement of Migdal. The meager building remains might have been farm buildings or agricultural storerooms. This evidence sheds light on the settlement’s southern boundary and the use of the flat and fertile area where Nahal Arbel debouched into the Sea of Galilee in antiquity. Abu ‘Uqsa H. 2001. The Findings from Two Excavations at Migdal. ‘Atiqot 42:9*–25* (Hebrew; English summary, pp. 320–322). Avshalom-Gorni D. 2009. Migdal. HA-ESI 121. Avshalom-Gorni D. and Najar A. 2013. Migdal. HA-ESI 125. 2. Squares G1 and G2, looking north. 3. Squares G3 and G4, a water channel(? ), looking west. 4. Square G5, pebble layer, looking northwest. 5. Square G6, section of a wall and floor, looking east. 6. Square G7, corner of a room and floor, looking north. 7. Square G8, a massive wall, looking northeast. 8. Squares E0–E2, building remains, plan. 9. Building remains, looking north.